Becca Johnson, owner of The Green Room Bakery, shows off a rosetta wedding cake, left, salted caramel cookie bars and a traditional wedding cake. 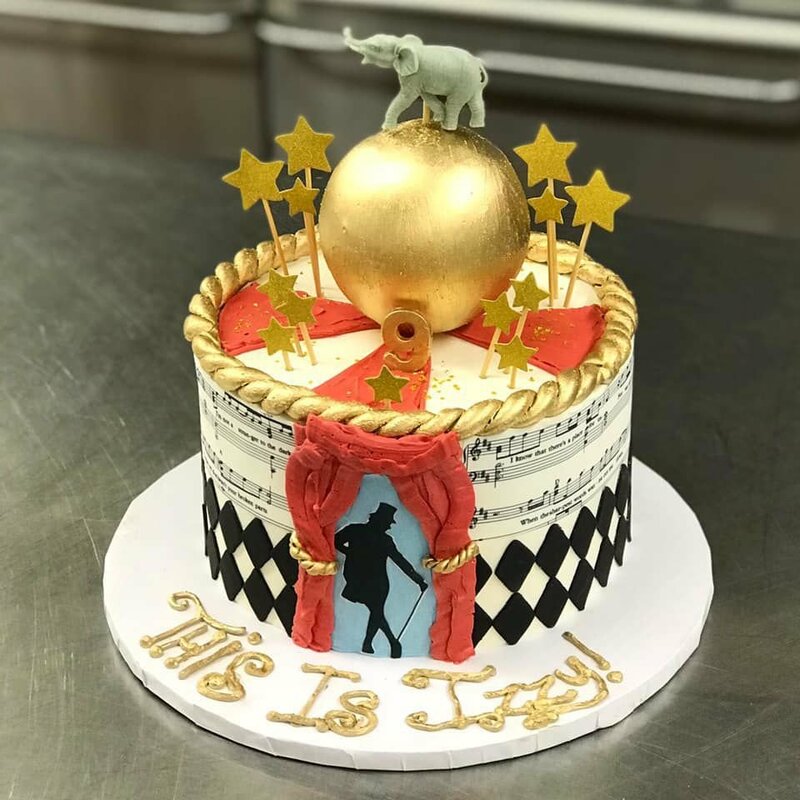 This “Greatest Showman”-themed cake was made for a 9-year-old girl. “This is Izzy” is based on the song “This is Me” from movie. This unicorn-themed cake was made by Becca Johnson. This wedding cake was made by Becca Johnson in the kitchen at The Spotlight Theatre and Event Center in Moline. Becca Johnson is a drama queen, but mellow. And she bakes that style and theatricality into her tasty treats. The energetic 25-year-old Davenport resident is the owner and founder of The Green Room Bakery, and special events coordinator and building manager for its home, The Spotlight Theatre and Event Center at 1800 7th Ave., Moline, which opened last spring in the former Scottish Rite Cathedral. “Ever since I was 10 years old, owning a bakery has been a dream of mine and is finally becoming a reality,” Johnson said recently. She and her husband, Doug, have a 3-year-old son, and Doug has two other sons, ages 15 and 16. He works from home, doing online marketing for a large "Dungeons & Dragons" store. A graduate of Davenport Central who also studied for a couple of years at Scott Community College, where she had a semester of culinary training, Johnson started cooking in her parents' kitchen after watching baking shows. “I was fascinated by the shows on TV and was like, 'I want to do that,'" she recalled. Her first major cake was a four-tier wedding cake made for a friend of her family in 2009. “It was awful. It was so bad,” she said. After that, she made birthday cakes for family members and friends, often using themes they selected. Samantha Brunat, Davenport, had Johnson make a cake for her stepson three years ago that had an "Incredible Hulk" theme and was done in different shades of green. Johnson also did a unicorn cake for her daughter, who turned 2 in August. At the Spotlight, Johnson opened the Green Room Bakery on the lower level July 1. It has a large kitchen and a 325-person-capacity reception room, including a stage. Johnson previously worked a year at Oh So Sweet bakery in downtown Davenport. Johnson took the job of building manager in November. The Spotlight has a list of recommended vendors. It includes the Green Room, but customers don't have to hire her if they have their event there. Events booked at The Spotlight include weddings, fundraisers, quinceaneras, and birthday parties. Johnson's desserts — including cookies, cupcakes, and bars — come in vegan and gluten-free options. For vegan cakes, instead of eggs, she uses applesauce, and instead of milk, almond or soy milk. This week, Johnson is making single-serving desserts for a Spotlight show for the first time. “Gentleman's Guide to Love & Murder” will open on Valentine's Day, and she'll sell salted caramel cookie bars, chocolate-covered strawberries, and French macarons (cookies) for $2 to $5 each. Johnson got into theater in 2008 after attending a theater camp at the Center for Living Arts, Rock Island. She attended the center's camps through high school. “That was my home away from home,” she said. She was in a junior production of “Rent” once a month for a year (2011-12), and that's where she met her husband (he played Mark, and she was Mimi). They married in 2013. Johnson's stage credits include the Black Box “Rock of Ages” (2017), and QC Theatre Workshop's “Reefer Madness” (2018) and "Bat Boy" (2014). She directed “Putnam County Spelling Bee” at Black Box in 2017. At the Spotlight, she's busy in the theater teaching kids' classes and doing choreography for “Mary Poppins Jr.,” to be performed by kids in April. Tubbs said Johnson is equally talented in all her endeavors. “It smells amazing in the building, not just because of her,” Tubbs said of the center's lower level, noting the new Prep to Table business is there as well, where Khloe Beaird makes healthy, convenient meals to go. You can see more of Johnson's creations at thegreenroombakery.com/gallery.